Location: Glenarm, County Antrim, Northern Ireland. Ownership / Access: Randal, Viscount Dunluce. Notes: Glenarm Castle, Glenarm, County Antrim, Northern Ireland, is the ancestral home of the Earls of Antrim. There has been a castle at Glenarm since the 13th century, and it is at the heart of one of Northern Ireland's oldest estates. The present castle was built by Sir Randal MacDonnell, 1st Earl of Antrim, in 1636. It is currently owned by Randal, Viscount Dunluce, the son of Alexander McDonnell, 9th Earl of Antrim. The Castle's Walled Garden is open to the public between May and September and hosts many events. In July of every year the grounds are the site of a world class Highland Games. The Dalriada Festival is also held at Glenarm Castle and within the local village, which celebrates sport, music and fine food from all over Scotland and Ireland, as well as hosting traditional Ulster Scots cultural events. 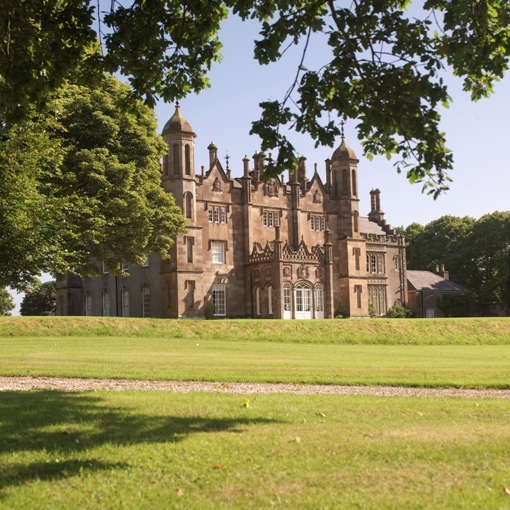 As part of the Dalriada Festival Glenarm Castle has started to host large outdoor concerts which as of 2012 has welcomed artists like General Fiasco, The Priests, Duke Special, Ronan Keating, Sharon Corr, Brian Houston, David Phelps and the likes. Summer Madness, Ireland's biggest Christian Festival, moved from its annual residence at the Kings Hall, Belfast, to Glenarm Castle in 2012. It is thought this Festival will return to Glenarm, on a yearly basis, for the foreseeable future.